Did you know that Hebrew is the only language in history to have returned to regular spoken use after having no native speakers? Between the 3rd Century C.E. and the late 1800’s, Hebrew was a language of prayer and bible study, studied by rabbis and scholars. Today over 5 million people speak Hebrew as their mother tongue, and over 2 million more speak it as a second language. In Learn Hebrew Pod shiur chamishim veshta-im, no doubt we will continue adding to our ability to speak it ourselves! We will also learn more about one of the central figures responsible for bringing Hebrew back to life: Eliezer Ben-Yehuda, often called the Reviver of the Hebrew Language. But of course, for a language to be truly alive, reviving it not enough. How does a language spoken by millions keep up with modern ideas, modern technology, even modern sports? 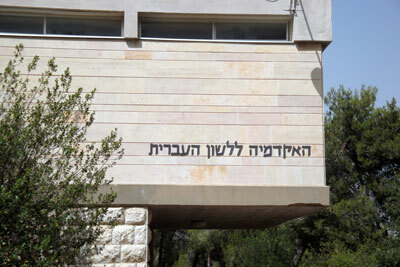 The Israeli Knesset helped to answer this question in 1953 by creating the Academy of the Hebrew Language--Ha-Akademia Lasafa Ha-Ivrit--as the “supreme institution for scholarship on the Hebrew language.” The Academy is the successor to the Hebrew Language Committee (an organization co-founded in 1890 by Eliezer Ben-Yehuda himself). While the Academy’s decisions are binding upon all governmental agencies, including the Israel Broadcasting Authority, they are, of course, not binding upon the public. So every day in Israel, on the streets and in the coffee houses, the daily speakers of this living, breathing language contribute to Hebrew’s constant renewal and growth. 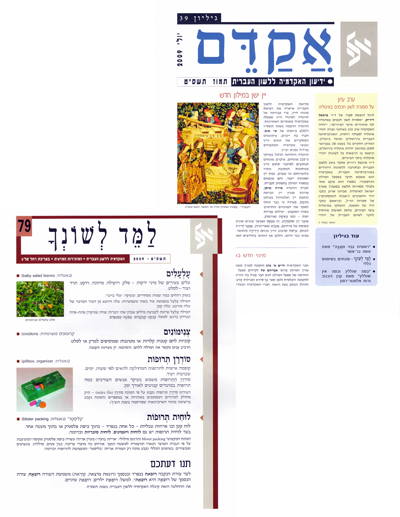 Photos used with permission of The Academy of the Hebrew Language. For more information about the Academy, its daily work, and its many publications and projects, please visit the Academy's website at http://hebrew-academy.huji.ac.il/.